This, the most beloved of San Antonio luxury hotels, is now restored to the opulence that made her storied halls the haunt of politicos, princesses and a-list celebrities. This designated national historic landmark has been completely renovated to offer the grace, style and service of a bygone era with the modern conveniences today's travelers require. 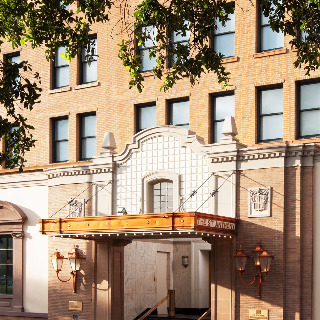 Overlooking Travis Park, our downtown San Antonio hotel is three blocks to both the Alamo and the River Walk. Discover the distinctly diverse personality of San Antonio in grand style. Set along the spectacular River Walk, Grand Hyatt San Antonio places you near trendy downtown bars, hot clubs, Zagat-rated restaurants and all the attractions that make this one of the most culturally rich cities in the country. Visit the San Antonio Museum of Art, and take in collections of Latin American and Asian art, or plan a family day at Six Flags®, just minutes away. 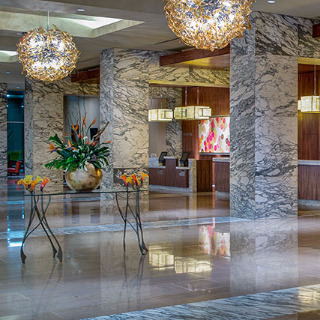 The foyer entry of our grand accommodations offers a gracious Texas sized welcome, while a contemporary design and upgraded amenities make our San Antonio, Texas hotel one of the premier lodging options in the city. 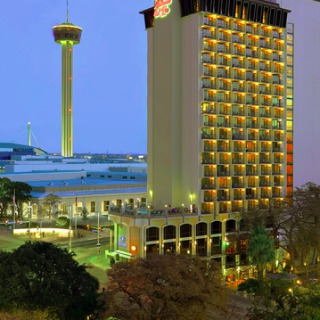 Conveniently, Grand Hyatt San Antonio is the only hotel adjacent to the Henry B. Gonzalez Convention Center and within walking distance of the Alamodome, Tower of The Americas and The Alamo. Our iconic 38-story San Antonio hotel is just steps away from the world famous San Antonio Riverwalk, premier shopping, dining and entertainment destination. 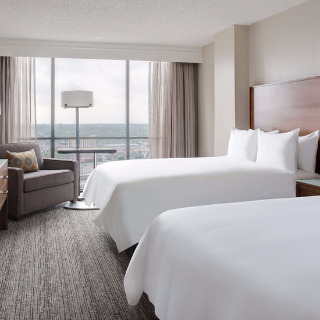 The San Antonio Marriott Rivercenter features 1,001 luxurious rooms and suites, guests will enjoy supreme comfort conveniently located near many area attractions, including Sea World, Six Flags Fiesta Texas and the San Antonio Zoo. The Alamo, one of the nation's most storied and revered landmarks, is within easy walking distance from our hotel. Our River Walk hotel is designed for relaxing, with LCD TVs, premium cable, high-speed Internet access, and Marriott's Plug-In Technology in each guest room. For events, 2014 Cvent Top 100 Hotel, along with 2014 Meetings & Conventions Magazine Gold Key & Gold Platter Award Winner, boasting premium San Antonio event space, plus proximity to Henry B. Gonzalez Convention Center. 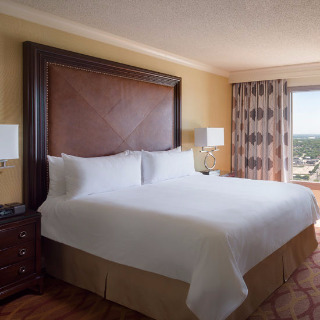 Make the San Antonio Marriott Rivercenter your hotel of choice in San Antonio. Our San Antonio Riverwalk hotel charmingly captures the vibrant culture and style of this romantic city, welcoming you and ensuring an enchanting stay. The Marriott San Antonio Riverwalk is located in the heart of downtown San Antonio, offering sweeping balcony views of San Antonio's fabulous Riverwalk district. Our 30-story hotel invites guests into a contemporary lobby with Texas flair: chili-red walls, dark-wood trim, and wrought-iron accents. From our location in downtown San Antonio, you can explore the historical, the cultural, and the vibrant culinary scene along Riverwalk, just steps from our door. Our Meetings & Conventions Magazine Gold Award-winning hotel across the street from the Henry B. Gonzalez Convention Center, and just three blocks from the Alamo. Stunning event spaces boast the perfect setting for a gorgeous San Antonio wedding, and our meeting rooms can accommodate up to 1,000 attendees. Discover the leader of San Antonio Riverwalk Hotels, and make your visit one to remember. If the River Walk is your primary destination, Hilton Palacio del Rio is the place to stay. Every room in our hacienda-style hotel has a balcony overlooking the River Walk or the city. Our location also places you in walking distance of restaurants, bars and shops. We're across the street from the San Antonio Convention Center and have 25 meeting rooms for your next event. Be sure to check out our famous Durty Nelly's Pub. Comfort and convenience seamlessly flow from the state-of-the-art lobby to the well-appointed guest rooms at Courtyard San Antonio Riverwalk. In the middle of all of the action, our hotel on the River Walk in San Antonio overlooks the popular River Walk and offers easy access to SeaWorld San Antonio, the Alamodome, Alamo and Hemisfair Park. Guest rooms offer unforgettable views, and boast signature bedding with complimentary Wi-Fi . Our welcome center offers plenty of places to gather, meet, relax and dine centered on The Bistro - Eat. Drink. Connect. The outdoor patio also is a perfect spot to unwind. Go for a swim in our outdoor pool, or work up a sweat in the fitness room at one of the premier San Antonio River Walk hotels. If being productive for work is a necessity, our 8 meeting rooms feature modern equipment and an onsite business center. It doesn't matter if you're in town for a conference or just vacationing with your family. 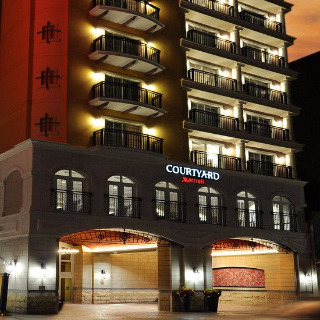 You're sure to remember your stay at Courtyard San Antonio Riverwalk.